On Saturday, Councilmember Mitch O’Farrell hosted a bike lane dedication for a half-mile of new north-south lanes on Virgil Avenue between Santa Monica Blvd. and Melrose. The project includes all new pavement, bike lane and Continental Crosswalk striping, as well as removal of peak hour parking restrictions. The lanes connect to Santa Monica Blvd. bike lanes that extend east from Virgil Avenue to a larger bicycle network. 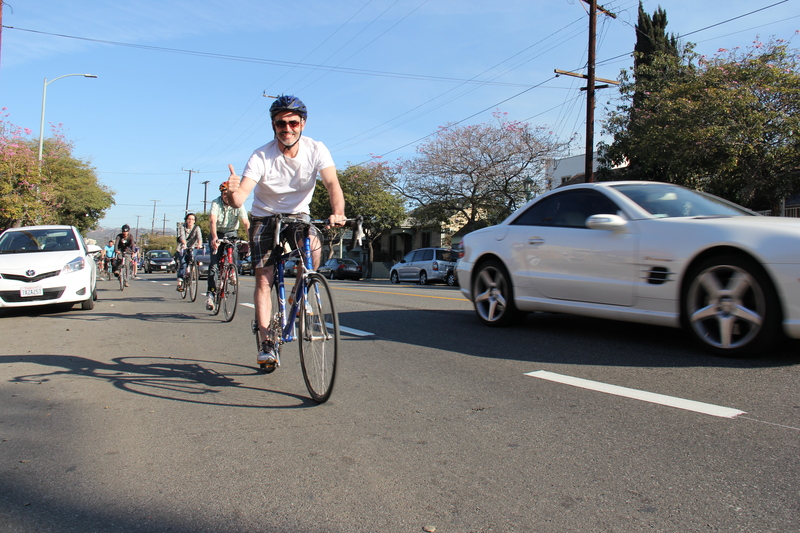 A list of bicycle lane projects for 2014 shows the lanes being extended another 1.5 miles south to Wilshire Boulevard. “During a community meeting in September, my constituents in Virgil Village asked for a safer Virgil Avenue,” said O’Farrell. Now let’s get some bike counts to see if anyone is actually using these bad boys! Or… we could push to implement lane extensions in both directions to make them more effective and give time for people to consider route and/or mode shifts to utilize them. Kudos to Councilmember O’Farrell for getting these safety improvements implemented!! Also thanks to Garcetti, and Garcetti deputy Marcel Porras for doing the early heavy lifting on this project! Look! They’re on the plan for next year! I’ll be able to bike in nearly a straight line all the way from Hillhurst down to USC, with a dedicated lane the whole way, except for half a block on Wilshire! I’ve already driven on Virgil a few times since then (because my parents were in town – I normally don’t drive more than once a week at all), and biked on it once, and I’m really amazed at how much more people-oriented the street feels. Similar treatments on other streets (I’m thinking Rowena) don’t seem to have had such a sudden change in the character of the neighborhood. Yep, and I was on the Steering Committee. I’m pretty sure this segment is in fact already done. Of course, it’s a parking lane outside of rush hour, but the ones on Sunset are definitely wide enough to be decently comfortable even with a parked car, so hopefully these are too. I’m definitely planning to try this route some time soon even though it’s not fully laned yet – my main concerns are where Virgil crosses all the funny angled streets like Silver Lake/Beverly/Temple. Even before that, it was in Alta’s early draft of the L.A. City bike plan – circa 2008 – which helped get the discussion going in then-councilmemember Garcetti’s office – which lead to the planning grant to LANI… then to lanes!! This bike lane is a NIGHTMARE. I’m ALL for cycling but I live on Middlebury, between Hoover and Virgil. Since this lane went in, I think I’ve seen maybe 2-3 bikes per week using the lane? Traffic has slowed to a crawl, not just on Virgil, but also on Hoover. It now takes 4-5x the amount of time to drive a half mile along either of these streets and the air pollution from car exhaust has exacerbated the already bad air we have due to our proximity to the 101. I WISH this wasn’t the case. I want to be long-term thinking but this bike lane was a bust. Megan, I live just up the street on Normal/Virgil. Let’s hang out on corner with the drunks and count people on bikes, I think we can find more than 2 people per week. In my experience from living in Virgil Village before and after the road diet, people still don’t feel safe riding in the bike lane and still use the sidewalk. Why? Trash cans in the bike lane, cars in the bike lane, doors open in the bike lane. I almost got ran over by a motorcycle using the bike lane. The bike lane is only .5 miles long so it really doesn’t do anything. Call you Council member and tell him to remove the stop sign at bellevue/hoover. Yeah, so WHY put in a bike lane if people aren’t going to use it. I’m FOR the stop sign. There have been SO many accidents at that intersection and it’s almost impossible to cross down on Middlebury. This traffic is NOT all because of that stop sign. Joe, what are you trying to say? Can you be more specific? Other cities seem to know how/when to incorporate bike lanes. LA does not. SF was FULL of cyclists who demanded bike lanes and who now actually USE them. In LA… There are SO many complex issues (particularly along the fringe/poorer bits of LA) where the city doesn’t REALLY do a comprehensive evaluation of the complete impacts of decisions like this. This portion of Virgil was NOT one that was ready for/or able to handle a bike lane at this time. And, LAguttersnipe pointed out something important – I’m CLEAR now why the city is bothering to clear out the homeless beneath the 101 on Virgil – it’s probably because of the bike lane. Just one block over on Hoover, the homeless encampments are OVERFLOWING. We’ve got people hacking our water lines to wash clothes and using our side yards as toilets. Kids walking by to go to the soccer field or schools near there have to run into the street to get around the covered sidewalks. It’s crazy and no one seems to care. I think the city knew that the closest neighbors to Virgil wouldn’t protest. The city of L.A. has nearly completed 0.8 miles of new road diet bike lane on Fletcher Drive, extending from San Fernando Road to Eagle Rock Boulevard. The lanes contribute to fairly strong bikeway network in northeast L.A.